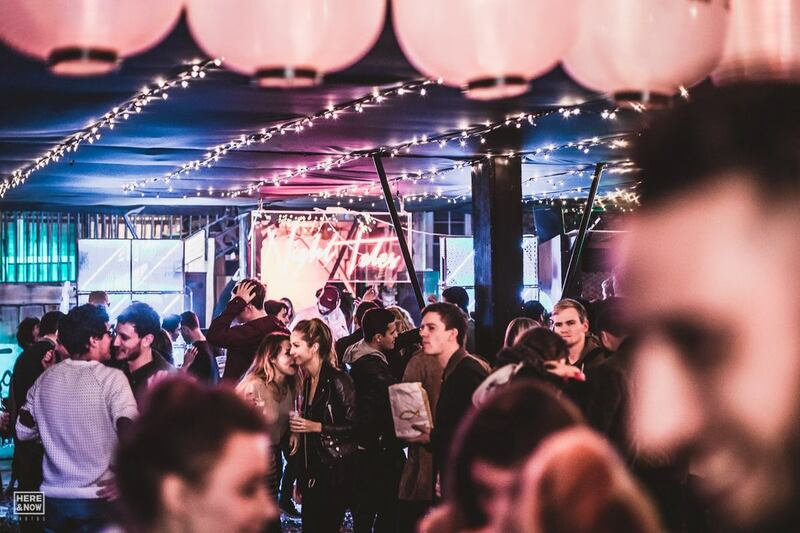 A slice of Japanese culture soundtracked by underground dance music can be found in Shoreditch at Night Tales. 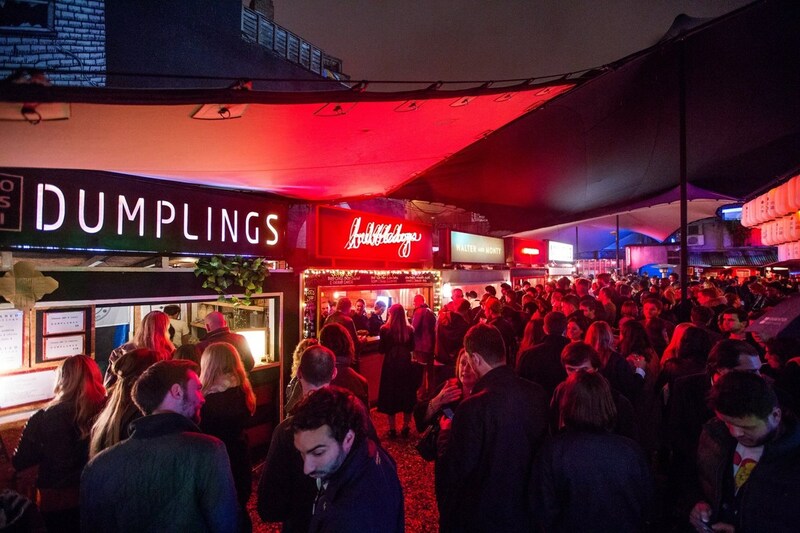 Until Christmas the foodie pop up is serving up Tokyo Nights, looking like a scene from the back streets of Japan featuring four bars, eight Ryokans (Japanese houses), a Love Hotel and six food outlets serving Asian and contemporary food. We headed along on Friday, November 13th to get a taste. If it wasn’t for the entrance on Old Street, you’d probably not know Night Tales exists. Its high walls means you can only glimpse the neon lights through some of the gaps between structures, so until you’ve been inside it’s hard to fully grasp what it might be like. As we made our way in, we walked down the covered entrance walkway which opens out into a bustling main space with a main bar, a cocktail bar and food stalls around the outside of a wood-chip covered floor which had plenty of long tables and benches to sit down, plus an open space in front of the DJ booth for dancing. We didn’t see who was on the decks at first playing downtempo vibes to us early arrivals at 6.30pm, but we had heard secret headliners this season had already included Maya Jane Coles, Maribou State, Will Saul and Future Disco DJs. You could easily pretend you had been transported into the futuristic Blade Runner neo noir version of a street market. Our first port of call was the main bar. Thankfully it’s a long one so it was never hard to get served even when the main space became crowded, and we opted for the Night Tales larger on draft which has a crisp, refreshing taste, and took a closer look around. The Tokyo Nights theme has captured that glossy vision of Japanese culture with its neon light sights, laterns hanging over the dancefloor and a bustling feel while the street food vendors were offering gourmet dumplings, burgers, hot dogs and curries with a Japanese twist so you could easily pretend you had been transported into the futuristic Blade Runner neo noir version of a street market. Dotted between the bars and vendors were staircases leading to a Ramusake eight course tasting menu and the Love Hotel, but we opted to head up the stairs behind the DJ booth to the mezzanine sake bar with plenty of seating and a sizeable sake menu to choose from. From the mezzanine you can looks down at the crowd below - beware, it’s capacity is limited - and also feel like you’re getting a break from the hubbub. We enjoyed our beers then decided to approach the warmly glowing sake bar to see what it had to offer. From the cocktail menu the Shinjuku Negroni proved a strong option with Nikka Coffey Grain Whiskey, Campari, vermouth and orange to get the blod flowing while a Lychee Martini of vodka, lychees, Cartron Lychee Liqueur, lemon and sugar good for the sweet tooth. A warmed Black Dot Enter.Sake developed by Richie Hawtin provided a refreshing short. As hunger set in, a trip to Patty & Bun’s stall ended in an ordering of their Slap Dashi special. It was a cold Friday evening so we welcomed the fact Night Tales is largely a covered space with heaters dotted around, though we did envy those who had reserved the cute booths to snuggle up in - especially if there were a few of them. As hunger set in, a trip to Patty & Bun’s stall ended in an ordering of their Slap Dashi special of an aged beef patty, bacon dashi, tsukemono pickles, kewpie mayo, and rayu ketchup in a brioche bun supplemented by fries. The juices flowed out of the burger as it was demolished with another round of drinks from the main bar. We’d finish our Tokyo Nights experience moving from the comfort of the sake bar down to the dancefloor where Geddes - the veteran underground house and techno DJ who is also behind the NoFitState parties and Murmur label - was getting on the decks as part of the Disco Dojo-curated evening. Armed with a couple of final cocktails from the downstairs bar we got well placed to throw some shapes and keep warm. We spied Normski skulking around behind Geddes, perhaps hoping to play a set himself. The music is perhaps a key draw for many, and having acts like Geddes who understands London dancefloors particularly well, really helps the vibe. 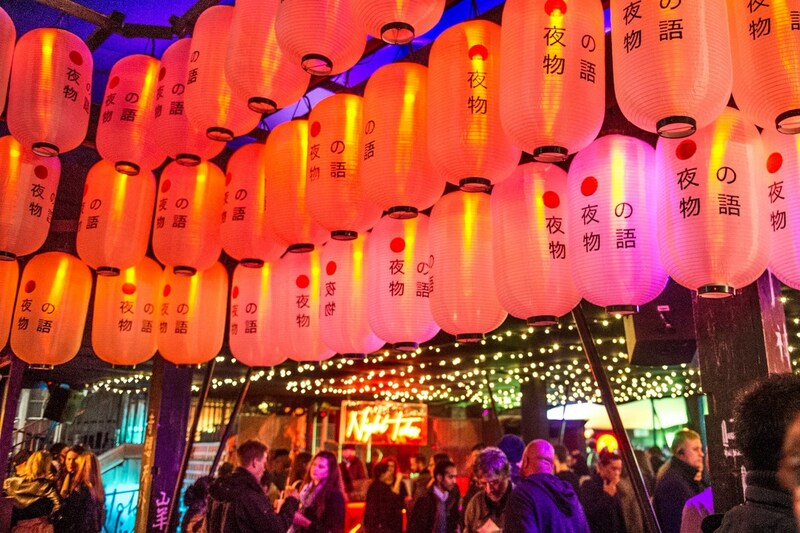 Tokyo Nights is a prized London pop-up. We’d leave at 10pm with Night Tales bustling despite the increasingly cold temperature, however with special events such as a sake night next Thursday (November 19th) featuring the full range of Richie Hawtin’s Enter.Sake accompanied by a DJ set from Hito, a Ramusake eight course tasting menu available every day of opening and music from Electric Minds, RTN, You Are We, Late Night Tales with Jungle, Kubicle and Dimensions Soundsystem still to come, Tokyo Nights is a prized London pop-up. Tokyo Nights at Night Tales runs Thursday to Saturday evenings until Saturday, December 19th. For details and to book tickets or an area go to nighttales.co.uk.